A cabalist who flourished in the second half of the fifteenth century; born in Constantinople. He migrated to Italy, and became distinguished there as the teacher of Pico della Mirandola, "the Italian prodigy," in Hebrew and the Cabala, thus contributing toward the spread of Jewish mysticism among the Christian humanists (see Cabalists, Christian). Allemanno's writings show great versatility and attainments. In his chief work, "Ḥesheḳ Shelomoh" (The Delight of Solomon), he evinces a certain philosophic acumen as well as a wide acquaintance with both the Arabic and the Greek philosophers. The introduction to this work is a discourse on the artistic and intellectual attainments of the human race, all of which are combined in King Solomon, whom the author places above Plato and his fellows (compare "Sha'ar ha-ḤesheḲ," pp. 3-7). Excerpts from the introduction were published, with additions by Jacob Baruch b. Moses Ḥayyim, at Leghorn in 1790. 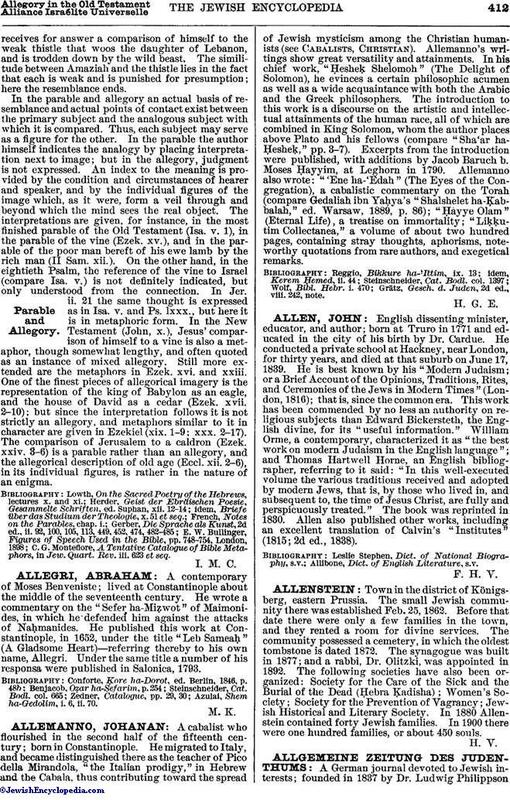 Allemanno also wrote: "'Ene ha-'Edah" (The Eyes of the Congregation), a cabalistic commentary on the Torah (compare Gedaliah ibn Yaḥya's "Shalshelet ha-ḳ;ab-balah," ed. Warsaw, 1889, p. 86); "Ḥayye Olam" (Eternal Life), a treatise on immortality; "LiḲḲutim Collectanea," a volume of about two hundred pages, containing stray thoughts, aphorisms, noteworthy quotations from rare authors, and exegetical remarks. Grätz, Gesch. d. Juden, 2d ed., viii. 242, note.